Last week I was lucky enough to receive a Sphero from the generous people of Orbotix. Kelly Tenkely just recently reviewed her Sphero which you can read all about here. Basically, the Sphero is a programmable orb that can be used to play games, as a controller, or even integrate into education. BTW, did I mention that it is waterproof too, and already has over 25 mobile apps to download. This post is going to be the first in a series that focuses on the SPRK (Schools Parents Robot Kids) program. The lessons in the SPRK program focus on Math, Physics, and Computer Science and are designed for 4th-5th graders. Of course, these lessons use the Sphero robotic ball to complete a variety of educational activities that can be done in groups and are easy to integrate into any classroom. 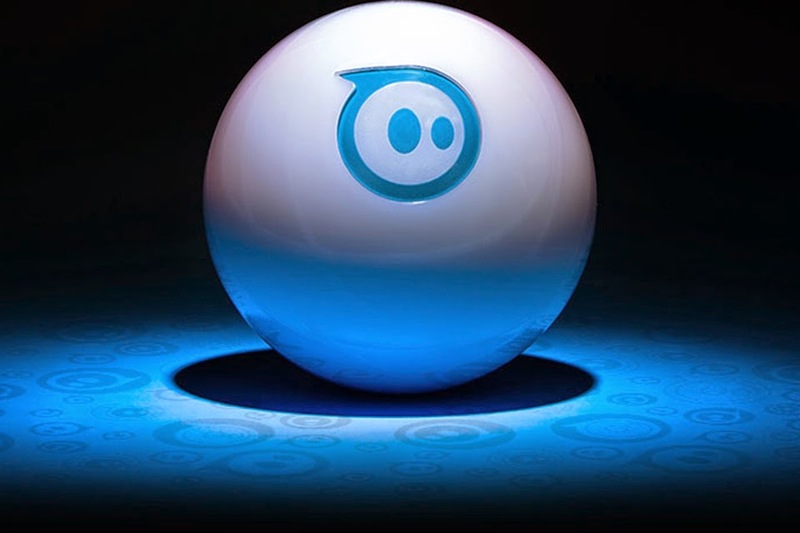 The Sphero itself is a ball that can roll at a given speed (that can be programmed), can light up in any color (can be programmed), and connects to almost any mobile device via bluetooth. Syncing of the Sphero is quite simple and just requires enabling blue tooth and rotating your finger on the device until the blue "tail" light of the Sphero is pointing directly at you the controller. Sphero - This is the basic app of using Sphero to do updates as well as just drive around for free play. Draw and Drive - A user draws a shape in a certain color on their device and the Sphero lights up in that color while following that pattern. MacroLab - Uses a GUI (Graphical User Interface) to program the Sphero using simple commands/macros. orbBasic - Uses a text based interface for more complex features of programming the Sphero. Sphero has an excellent web page for free downloadable lesson plans (5) that can be used by teachers and students. It includes a teacher guide, student guide, as well as a worksheet. The first lesson is for students to use the Sphero to show that there is a linear relationship between time, speed, and distance. Students will do this by programming the Sphero using the MacroLab app to travel at a particular speed for a certain amount of time and then measure the distance (using a tape measurer). They will then use division to find out the relationship between speed, time, and distance. Afterwards, the students will be given a task to have the Sphero move to a given location and then return to them using their knowledge from the MacroLab lesson. *All data will be recorded by the student in the downloaded worksheet. In starting out the teacher will provide the data for the student to use in their macro for programming their Sphero. Using MacroLab is pretty straight forward, launch the app on the mobile device, create a new macro, add a roll command, set the roll to move at 20% speed for 3000 milliseconds (3 sec). Finally, add a stop command to have the Sphero stop after completing the action. Anybody familiar w/ DOS or programming using Scratch or Alice should have no problem picking this up. A student will then put a piece of masking tape on the ground and place the Sphero there before tapping Play in the MacroLab. Once the ball is done moving they will measure from the tape to the ball. The second test will have the student modifying the macro to run at 6 seconds and then at 9 seconds recording the results. At the end they will divide the distance of the 6 second experiment w/ the 3 second experiment, and also the distance of the 9 second experiment w/ the 3 second experiment. Students should be able to notice that when something travels at a particular speed if it goes twice as fast it will goes twice as long forming a linear relationship. For the second experiment the students will modify the macro to run again at 20% speed and 3000 milliseconds (3 sec) and record the data again (it should be similar to the first time). Then they will modify it to run at 40% speed and 3000 milliseconds and run the test again recording how far it goes. Finally, they will modify the macro to run at 60% speed and run at 3000 milliseconds to see how far it runs and record the data. At the end they will divide the distance from the 40% experiment to the 20% experiment, and also the distance from the 60% experiment by the 20% experiment. Again students should notice that if something travels twice as fast it should go twice as far again showing a linear relationship. After the students have completed the previous two exercises a teacher can then give them a challenge to see if they can program the Sphero to go a certain distance and then have it return to them. To do this the students can modify the macro to roll for 40% speed and a delay of 5000 milliseconds (5 sec). Then to modify it to roll at 20% speed w/ a heading of 180 degrees (which will cause the Sphero to return from the direction it came). Finally, they need to add a stop command so the Sphero stops and then see if it has returned to them. The students have to determine what the correct value is for the delay to have it return exactly to them. For more information on using Sphero in Education click here!!! Stay tuned for my follow up post on 2D Geometry. For my Pinterest board on Sphero click here.